The Quantum synth from legendary makers Waldorf has landed, and once you take it out of the box, it’ll do so with a satisfying thud. It weighs 17.8kg. With a full five octaves of high-quality Fatar TP8S keyboard, the colours are nailed to the mast in more ways than one. It’s clearly a synth to be played, but it’s also immensely colourful, thanks to the central touchscreen display and the number of glowing LEDs which are scattered liberally around the front panel. Strangely, one of my favourite views of the Quantum is from the side. The substantial brushed-metal chassis is inset with wood panels, flush to the side, while the front panel’s stark, brushed-black finish is interrupted beautifully by the all-important pots and display. It really is a great piece of design, finished to a very high spec, which feels lush when in use. and chosen patch as desired. During editing or tweaking, any given pot or button will immediately dive to an appropriate place on the touchscreen, giving very clear indications about the relevance of what you’re doing. A particular favourite of mine is the Envelope page, where the triggered gate dances over the displayed image, with the repetitions offering a beautiful visual cascade. Turning my attention to the front of the signal chain, I must first clarify what the Quantum offers. It’s a multifaceted machine, with defined areas for sound generation, all of which are generated from three identical oscillators, which layer up to form a single patch. 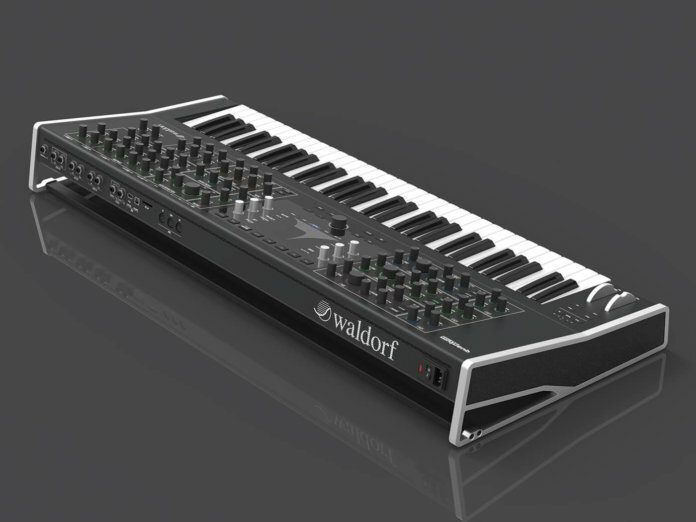 In keeping with the legacy of Waldorf, Wavetable synthesis is the first mode of synthesis to get an outing. Pressing the Wavetable button immediately illuminates the settings control pots, of which there are seven, in a radiant blue shimmer of LED colour. Other forms of tone generation similarly illuminate, but in helpfully differing colours to clearly show which oscillator is producing which tone. The screen also springs into wavetable life at this point, indicated by the sharpness and clarity of the display, as the 3D model of the wavetable becomes a visual. Not surprisingly, the Quantum ships with a considerable number of wavetables, full of large amounts of harmonic content and colour. This extends from traditional Waldorf wavetables, seen in its other products, to their newer Nave technology, allowing for the creation of stunning Kraftwerk-esque vocal-styled formants derived from user-inputted words or phrases. The rear-mounted SD slot also allows user-generated content to be loaded in. Once you’re looking at the wavetable, movement is easy, thanks to the pots which immediately dedicate themselves to control duties. The most obvious position pot allows immediate sweeping across the wavetable, while a position line on screen shows you just where you are. 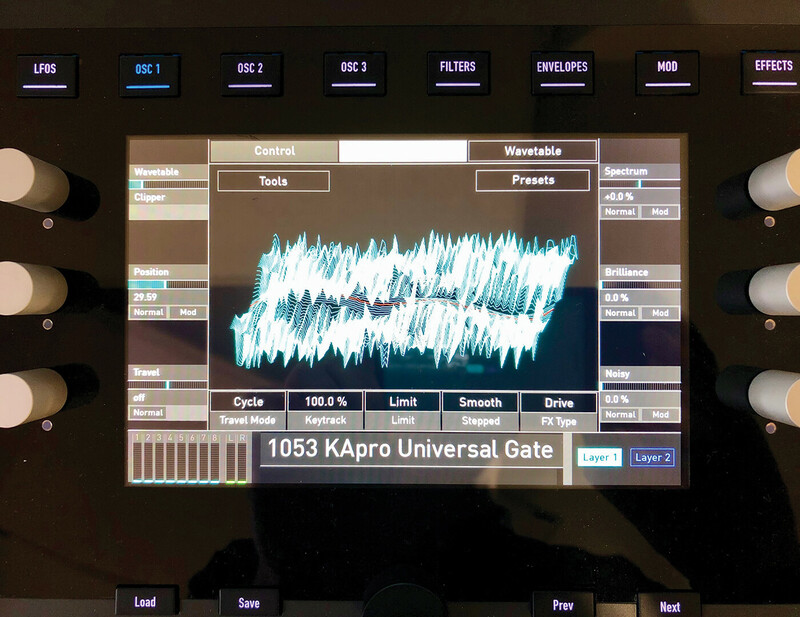 Selection of another wavetable is made via the touchscreen, with an easily navigable menu and six matching rotary encoders located either side, while it’s also possible to scroll by touching the screen directly. Meanwhile, the rotary pots within the oscillator section will doubtless provide the quickest access to the control of timbre, with legends clearly written next to each. Travel allows for cyclic movement through the wavetable although, disappointingly, this movement is not displayed in real time. However, some pretty radical timings are available. It’s a little fiddly when working with the larger values, but I saw a figure of 2,943 seconds appear, which translates to 49 minutes. That’s one long cycle across a wavetable! Away from the impressively absurd, movement can increase up to 40Hz, generating beautifully cyclical tones. Being a huge fan of wavetable, I quickly became completely lost in the world of the Quantum, purely within this section. The possibilities for sonic creation within this area alone, just with a single oscillator, are pretty vast. I certainly think that it’s the pleasure and the ease with which all of this happens that truly makes the Quantum what it is. Moving on to the second form of timbral starting points and we have something altogether more familiar, with the appearance of traditional subtractive-style waveforms. Employing Osc 2 for this purpose, you immediately notice the oscillator mixer section mirrors the LED colours shown in the corresponding oscillator section. That’s a simple and neat trick, but very effective. Saw, sine, triangle and square waves are all available, along with white and pink noise; but moreover, the warp parameters allow for the traditional waves to be transformed in the style of pulse-width modulation, with the resulting wave being displayed onscreen. The Count parameter will super-size your wave, with further options to thicken the texture via detuning, and the ability to spread the resulting wave across the stereo image. It sounds unbelievably impressive, which took me slightly by surprise; this wasn’t really an area where I thought the Quantum would impress, not with all that wavetable gloriousness alongside it. It underpins how easy it is to shore up a timbral construct, where a given wavetable element might lack the required sub-harmonic depth. Next up, we have the Particle mode, which is described as a sample playback element. Sure, this is its primary task, and in rooting around the preloaded content, I found a piano sample, but you know it’s about far more than just playing back samples. The strength here is more about granular synthesis, although there are some serious sample playback capabilities that make it impressive. Working with the piano sample, it was very easy to mutate it considerably. With the waveform firmly on display, the immediate access to elements such as pitch, travel and grain number had the sample quickly moving firmly away from any semblance of piano. Again, it’s the hands-on control with the display that makes very light work of any edit. So, finally, we move to the last oscillator component, which is resonator. This quickly became something of a favourite. The concept here is to load an impulse signal which could then be fed through a bank of band-pass filters, with the ability to twist and shape the filters in a number of ways. In many respects, it’s most effective with shorter, more percussive samples and can be incredibly endearing on its own, especially when making timbral changes in real time. But adding this to one of the other oscillators in any of the other modes immediately adds a beautifully crisp, clean but often weighty timbre to a patch, which has that great ‘is it acoustic or digital?’ feel about it. It is all rather reminiscent of other modal-based synthesiser concepts that I’ve encountered before, but comes with the sort of control that even a Eurorack user would envy. With all of this sonic goodness available to three-component layering, the Quantum is clearly something of a sonic powerhouse. While the touchscreen is useful, I did find myself spending more time with the rotary pots; but there’s no doubt that the presence of the touchscreen often provides both a vital clue and an easy escape route, when delving into the architectural depths of programming. Having set up the front end of the signal, it’s time to move toward the filter section which, in line with Waldorf heritage, offers an essential analogue ingredient. In essence, there are two analogue low-pass filters, with an additional digital filter element. The analogue filters are switchable between 12/24dB filter types, either clean or saturated. They sound predictably classy with plenty of resonant squeal if desired, but moreover, they can be linked through further filter presets that will allow either single usage or interaction between the two. Working in the most basic of modes, with a single LPF, there are clear definitions applied to the varying 12/24dB filter types. The 12dB/2-pole saturated setting quickly becomes something of a favourite, offering grittiness and presence, while additional controls for features such as stereo mode bring forth extra presence across the stereo spectrum. Moving into the realm of dual filtering, this presence becomes even more pronounced, as each filter element dances around the opposite side of the image. There are numerous positives to choose from here, including the simplicity of use, the individual control and even the ease with which things can be stripped back to the barest single filter. It all adds up to flexibility, with plenty of choice. However, once you begin to use the additional filter element, described as the ‘Digital Former Section’, the choice is further exaggerated to the extreme. 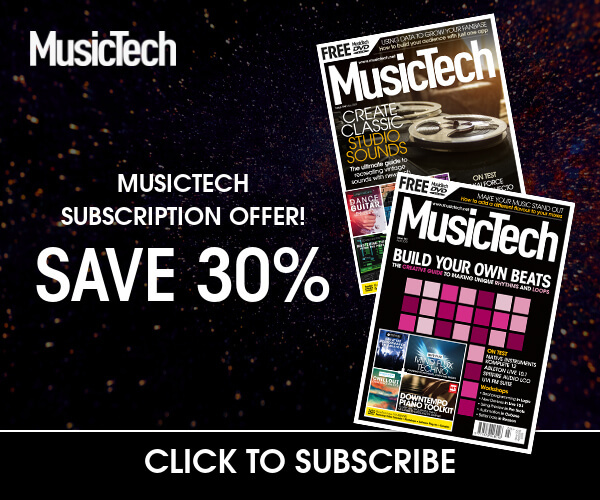 Offering a bewildering array of possibilities, the Digital Former Section largely models other filter types, drawn from PPG, Largo and Nave technologies, with filter types ranging from low to high pass, taking in notch and band-pass filtering along the way. Moving beyond regular filtering duties, the Digital Former Section also offers comb filtering and bitcrushing, which can be routed in series, either before or after the analogue filter section, or in parallel with it. I get the distinct feeling that the complexity of the filter section, with its extraordinary amount of choice, has been deployed to offer filtering capabilities to match the equally extraordinary variety on offer in the oscillator section. 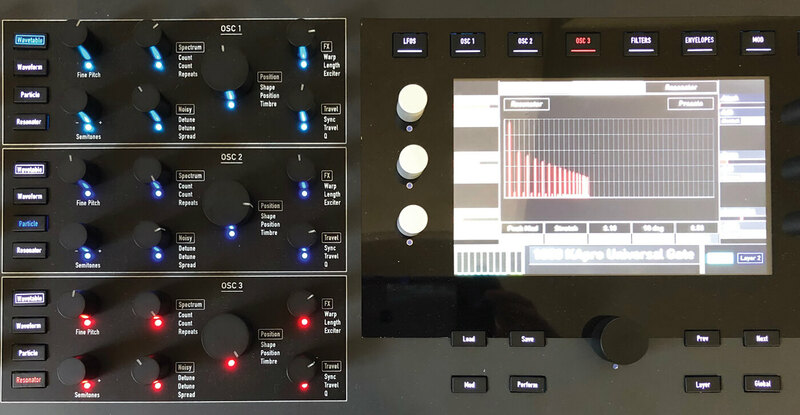 The interplay between analogue and digital filter sections, thanks to the basic but effective routing options, is immediate, and made all the more effective once movement is applied, via the numerous modulation options onboard. While we’re talking about modulation, three full pot-rich ADSR envelopes are routed to the two analogue filters and the amplifier. A further three envelopes, described as ‘free’ envelopes, can be found within the onscreen envelope menu, with touch control and editing – of course. There’s plenty of play within these envelopes, with absorbing timings of up to 60 seconds per phase, while they can also be shaped from exponential to linear, with a looping mode that will allow for Serge-like usage. Working with the envelopes is similarly pleasurable, with each note strike being displayed as a point moving along the envelope shape. Who would have thought that a humble envelope could become so absorbing? 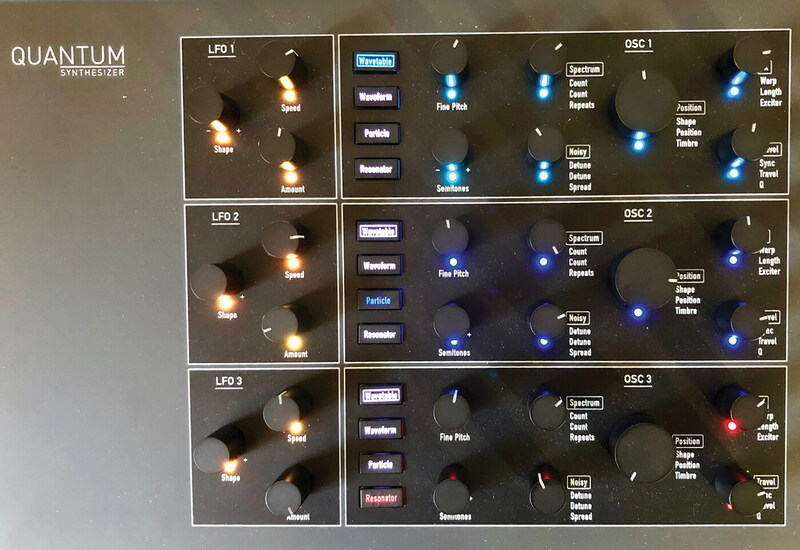 Moving to the LFO section, it’s a very similar story, with three LFOs available from the front panel, and a further three selected from within the menu screen. This area is fairly predictable, with sine, triangle, square, saw ramps (both directions) and sample and hold all being available. All can be sync’d or operate polyphonically, while phase and delay can also be controlled. However, the main reason for LFO simplicity is to make way for the Komplex modulator, which will allow the user to draw a modulation shape onscreen, allowing for complete freedom, as directed by the user. Once drawn, the resulting user waveform can be controlled using speed, blend and warp parameters, as seen elsewhere on the Quantum, while direct control using the Envelope and Entropy pots will affect the speed and random nature of the wave. All of these modulation sources are open to routing, which is complex in itself. Across the top of the centred screen, coloured buttons mirror the legends associated with each area of the synth, with the Mod button allowing immediate access of routing from all of the sources to pretty much any aspect of the synth. ‘Comprehensive’ is just too simplistic a word to describe the possibilities here, but while it sounds complicated, it is very easy to use. You’ll also find a MIDI-learn feature, should you wish to externally control a specific aspect over MIDI, via the usual set of MIDI controller parameters. It’s hardly surprising that preparation for this review has been a fairly intense process, but one that found me spending many pleasurable hours tinkering with the inner workings of the Quantum and, in many respects, this sums up what the synth is about. Once out of the box, I found myself immediately diving into the editing, while building and experimenting, but you can forget any sense of letterbox-style menu diving. Everything is quickly accessible via the screen or from the front panel. It’s an absolute beast of a synth, but unbelievably easy to use. I think it’s important to underline that this is not some clone of a vintage machine. Sure, much of the technology is based on previously seen tech, but it’s all brought together in a very contemporary and powerful way and using a Quantum invites experimentation far more than just preset browsing. We’ve only just covered the main elements of what the Quantum can do here. My only small disappointment is that it was more difficult to locate and use certain performance parameters, such as the sequencer/arpeggiator function, but with further OS upgrades on the way, I hope this very tiny detail will be addressed in the future. Ultimately, if you enjoy synthesis and experimentation, then this machine is a must to audition. Waldorf has been teasing us with information about this synth for some time, and now it’s finally arrived, I’m delighted that it doesn’t disappoint. As a creative tool, it’s an absolute powerhouse, allowing the user to do just about all that you might ask of a high-end synthesiser. As it’s so radical and new, I don’t feel that many of the presets show it off to its fullest potential, but if you bought this as a preset synth, you’d be missing the point. Although the presets are of course highly sophisticated, sound creation and editing is so easy, you’d be bonkers not to dive right in and get your hands dirty. It also feels very well made, with a striking design and look that turns heads. Yes, it’s expensive, but consider everything that you get and it could be a justifiable pro-level purchase. 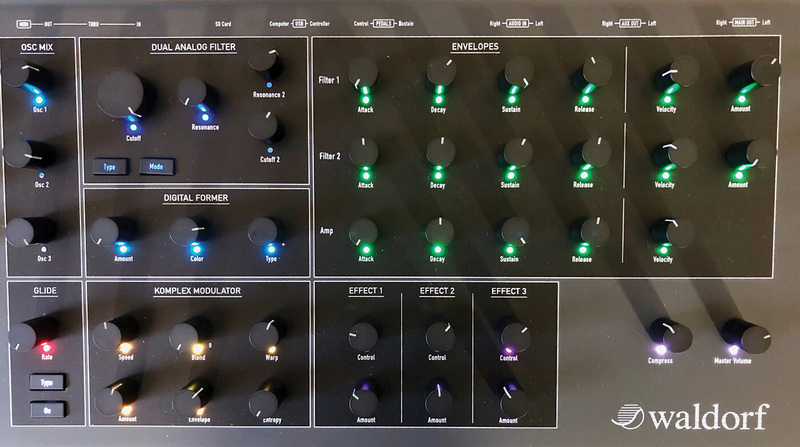 Although billed as a Studiologic synth, the Sledge offers an engine which is designed by Waldorf and, alongside traditional subtractive-style synthesis, contains a healthy smattering of Wavetable synthesis. 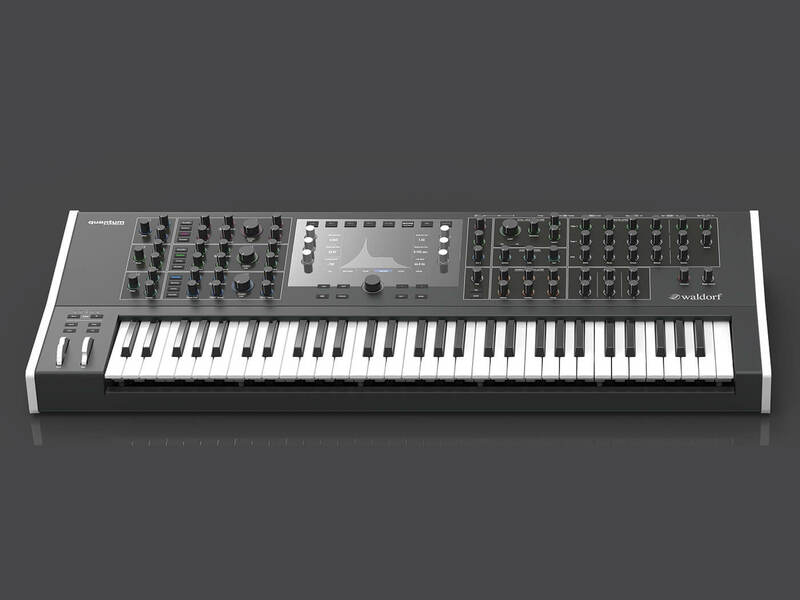 It might be a soft synth, but the PPG is credited as the machine that bought Wavetable synthesis to the masses, and this software incarnation offers all of that functionality, in an affordable package, at a fraction of the cost of the original machine. This is an outstandingly beautiful synthesiser, which offers a stunning design coupled with huge sound and creative potential.